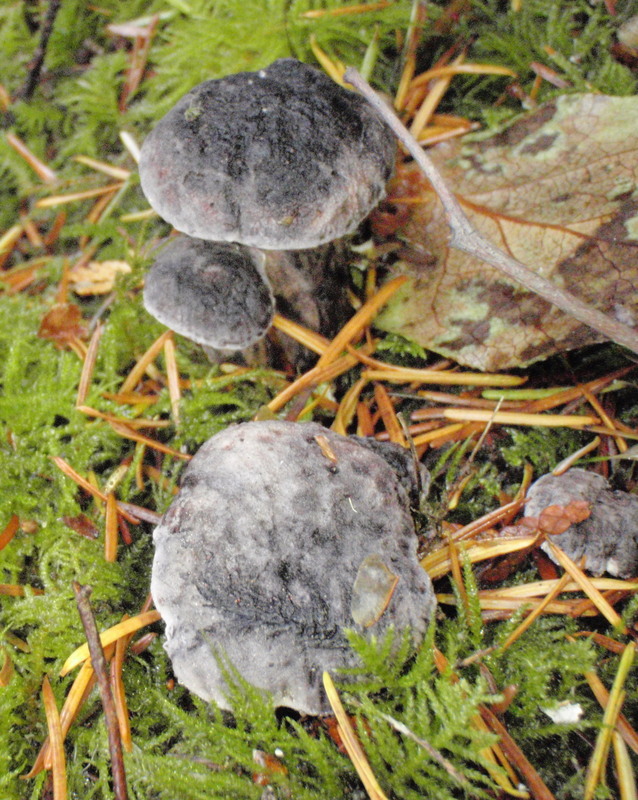 This might have been a good year for Sarcodon fuscoindicus—Violet Hedgehog—had the spot where I can usually hope to find a dozen or more good specimens (which happens to be at the side of a logging road) not been covered by two feet of gravel when the road was graded to make the area more accessible to logging trucks. That, combined with what seems to be a disturbing trend toward longer, dryer summers, led to my having just six smallish ones to play with this year. And play I did last week. 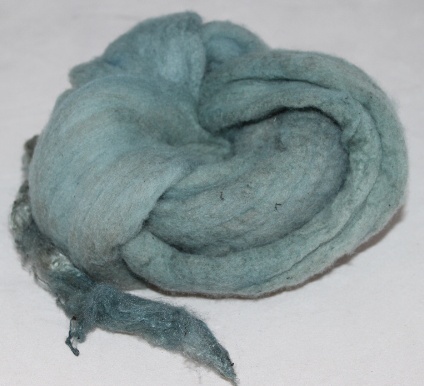 The dyebath, using equal parts dried mushroom to fibre (in this case wool roving), yielded a lovely blue. This time something interesting occurred: I cooked the mushrooms for an hour in a fine mesh bag, let them sit in the dyebath overnight, strained them out, added the fibre, brought the temperature up slowly to 80 degrees C (about 180 degrees F) and held it there for about 45 minutes. When the wool came out of the dyebath the next day, I was surprised to find several spots of a much deeper blue. This might well have happened had I cooked mushrooms and fibre together, but here I can only surmise that a fine residue had settled to the bottom of the pot to create those darker splotches. If I had an unlimited supply of these Sarcodon, I’d make a highly concentrated dyebath and attempt to achieve that beautiful rich colour! Even if I did, however, it’s unlikely the blue would retain its intensity forever. The little sample of greenish yarn on the left is some that I spun two years ago from wool that started out the same blue as the coil of fibre I have here. I’ve noticed this before with pieces I’ve knit from Sarcodon handspun— it’s best to savour the blue while it lasts, in expectation that it will eventually evolve into a pleasant, earthy green. Is this blue, or is this blue? 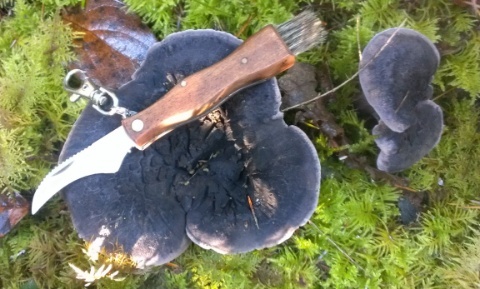 A couple of months ago, I rhapsodized about finding an unexpected treasure, an embarrassment of riches—Sarcodon fuscoindicus, or Violet hedgehog. A few weeks after that post, my dearest went out to the same spot and picked the buttons I’d left behind, resulting in about twenty pounds—twenty pounds!—of the fresh lovelies. I had no choice but to let them dry, given the bounteous mushroom season that required daily harvesting, so I only just got my dyepots fired up in earnest this week. And I couldn’t resist—I had to go for the blue first! I selected five dried hedgehogs, broke them into pieces, and put them into a stainless steel bowl, to which I added water and enough ammonia to bring the pH up to 10. The mushrooms soaked there for several days, after which I poured off about half the liquid into a medium-sized dyepot. 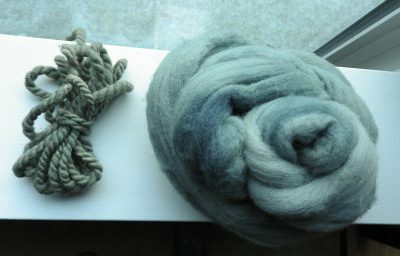 I’d already done a sample run, which revealed that fibre pre-mordanted with alum was most likely to pick up blue, so to the dyepot I added a good hunk of alum-mordanted wool roving and a piece of silk. I brought the temperature up slowly, all the while half holding my breath, because nothing seemed to be happening: all I could see was a dingy grey. Then, as the temperature rose to 160, then 170 degrees F, I noticed some blue in the wool as I raised it out of the water with a plastic spoon. At 175 degrees, I decided it was time to pull the fibre out. 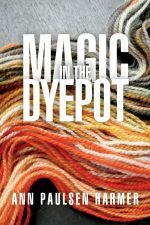 I carried the hot wool to the bathtub (my studio used to be a B&B cottage), where I draped it over the edge of a large plastic bucket, to cool without rinsing. The silk (the little curl in front of the wool roving) seemed to pick up the colour more quickly and with more intensity than did the wool, so my next dyepot will involve some silk garments. In the meantime, the exhaust of this first dyepot now contains some more wool— I ran out of time to bring it up to the full temperature, so I’ve left it overnight and will see if the mushrooms still had any magic to give. More and more, thoughts of witchcraft are entering my mind—cauldrons, magic, obsessions . . .
Now I understand the meaning of the term, “embarrassment of riches.” Everyone’s talking about the abundance of mushrooms of all kinds this year, and we can certainly attest to that: our dehydrator is going non-stop, I have drying mushrooms spread all over my studio floor, and we continue to come home with piles of mushrooms after every hike in the forest. And the season isn’t over yet! 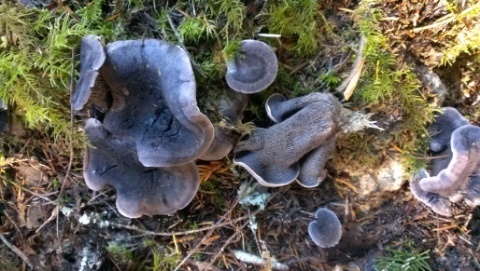 And this one—Sarcodon fuscoindicus, or Violet hedgehog—is a perfect example. Two years ago I was thrilled to find two or three specimens; last year I went back to the same spot and found none; this year I came home with 16 (yes, that’s one-six) pounds of them! They weren’t all this size—in fact, I left quite a few buttons in case I get back to that area again—but I can’t wait to see what they do in the dyepot! When I lifted the lid from my Crockpot the other day and saw these samples, my knees turned to jelly and I almost swooned from the enormity of what was before my eyes: blue yarn! From mushrooms I found myself! Here on the Coast! I’d found a group of these Violet Hedgehogs a few weeks earlier, but picked only the two larger ones, thinking I’d give the little buttons a week or two to grow. But on my return to the hallowed spot, they were nowhere to be seen. Either someone else found them, or I’d returned to the wrong hallowed spot. The yarn samples in this image were the first to go through the dyebath. 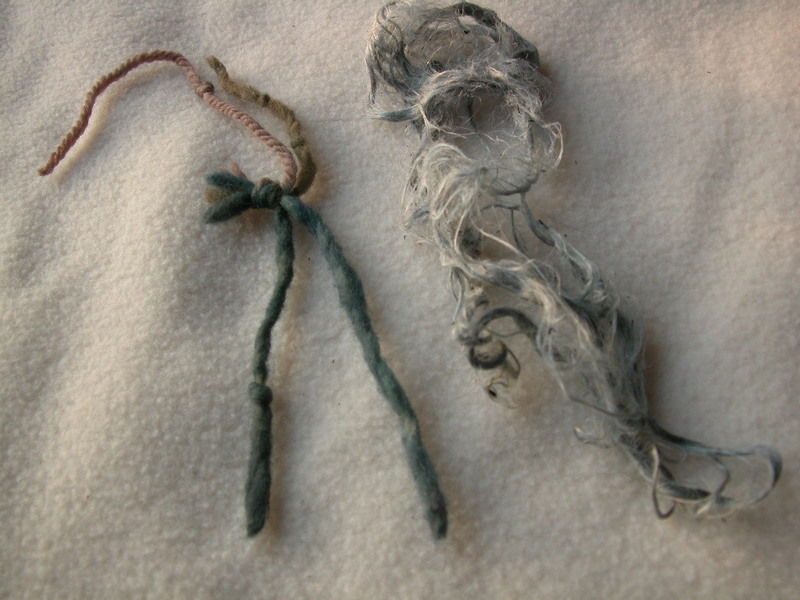 The blue strand on the left was mordanted in alum; the one on the right had no mordant. The pinkish strand was mordanted in iron; the green one in copper. The silk on the right (mordanted in alum) went in after I took those samples out, and it didn’t pick up as much colour as I’d hoped—but it’s blue, dammit! The remaining dyebath is still a rich, deep purply brown, and a second sample of silk has been sitting in it, on medium, for most of this afternoon. My next step is to shift the pH a bit higher with the tiniest addition of washing soda, to see if that might bring out more of the elusive blue. And my next step after that is to put out the word to all my mushroom friends that I’ll be looking for more of these next year. Thankfully they’re not edible.